The Tribeca is made by Rumba Time, this is a must have watch. Not only is it classic it is very elegant and I believe its going to be the next big hit when it comes to fashion and jewelry. I mean it has the pop and wow factor when worn. I love the colors and the studded band. Elegant yet you can wear it everyday for any occasion. The watch I choose is the Tribeca in black and Rose Gold . The beautiful hexagon shape and the studded band stand alone in themselves. This is the piece of jewelry, that can be worn both day and night as an elegant piece to any fashion outfit you are wearing. For days of working to the nights of partying. Slip on some extra bangles or bracelets and you have a unique look. This watch is going to be the fashion statement for every woman in no time. Rumba watches do come in 16 styles and well over 32 different colors. Beautiful and with its stylish and unique design, your going to want to add a Rumba Time watch to your jewelry collection! Women’s watch bands can be sized to fit 6.5-inch to 7.5-inch wrists. Imagine having the same watch that a big star will have and you will know that you received yours first. “Contemporary but elegant ” is the way to describe these watches. The one I have is so pretty that I wear it alone and it looks fantastic, and it compliments a beautiful outfit. Connect with Rumba Time on their Website, Facebook and Twitter. I like to change my watch with my outfits. This would be a great addition to my wardrobe. I like the uniqueness of this watch! I love this watch. This is really unique and nothing i’ve ever had before. This could really dress up any outfit you wear. This is so pretty. I haven’t worn a watch in years but your review of this one makes me want to. I love rose gold and I love this watch. I could wear it with so many things. I like how this watch looks. This would compliment so many outfits very nicely. I love the colors and style of this watch! I have considered purchasing a watch recently, I will check out their collection . I don’t always have the ability to pull out my cell phone and check the time. I love the simplicity with the shapes. It looks very cool. What a unique watch! I love it!! I love the simple clean, but sophisticated style of TriBeCa!! Great review and now I really, really want this watch!! I like the style of this watch. This is such a beautiful watch! I especially like the uniqueness of it’s style. Keeping my fingers crossed that I will win this. That’s a very pretty watch. I really love the unique look of this watch, along with the face shape, very different. Also the color combination works and would be perfect for Fall. I love the color combination which makes it perfect for everyday. This is a very interesting watch. I think it would make a great statement with a lot of outfits. I agree. I cant believe how a watch changes an outfit. I always get the most compliments on my watches. Great review. I love how this can be dressy or casual! I absolutely love the color/look of this watch! I also love that it can fit bigger wrists, because I am overweight. This would be great for me!!!! Really cool watch! Would look good on my arm lol. I love your review with all the information with styles, colors of the watch. It would be a great accessory for any outfit and a very nice watch. This is a beautiful watch! To be honest, I’m not much of a watch wearer, but this is one I would definitely wear! Love the unique design. I love it. So dressy and so casual. It would quickly become your everyday watch. This watch has great style, I love it!! A beautiful watch that my wife would love. I adore this watch! Beautiful design and color. I love that the face is a hexagon because it’s so unique. I’d have a hard time giving this away, but I’d consider giving it to my mom since she wears watches more often than I do. I LOVE the shape of this watch!!! 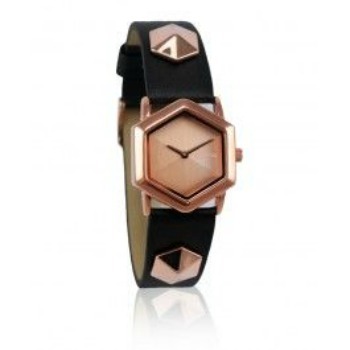 The contrast of the black and rose gold is gorgeous!!! I like this watch. So cool! What a good review!!! I can’t wait to see these up close to appreciate it’s uniqueness. Love that watch…..it has such a great design. I like how fancy it looks. I love the style of this watch. It can go with my work outfits. I love the watch, the rose gold with the black is really nice, I could see myself wearing this every day.